I bought this tent in 2015 along with a 'footprint' and took it to a 10 day camp, easy to erect and plenty of space for one person as I like to take lots of stuff. However, as previous users have found, condensation was a major problem which dripped down onto both the living & bedroom areas. Mildew formed very quickly on the seams separating the plastic seal from the seam. The following year I resealed the tent with spray and sealant but this didn't stop the rain coming in. Huge puddles gathered inside the tent. Bedding was affected. Do not buy this tent. Me and my husband purchased this tent last year for a family holiday. Its so easy to erect. Sleeping area very large and its nice to be able to stand up. My husband is six foot and can stand upright in the living area and slightly stooped in the sleeping area. I know its advertised as a four man tent but it does make a very comfortable and spacious two man tent. The tent itself is very well thought out. Would possibly benefit from more pockets. My husband and I purchased this tent in May 2014 along with the optional canopy, groundsheet and carpet. We first used it for a one night stay a few days after buying it. 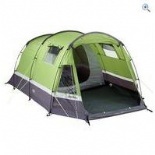 We found it was reasonably easy to put up even on the first try and is an ideal size for 2 adults. However, it rained overnight and we awoke to find that the waterproofing had not worked as it should and had let quite a bi of water seep through. We returned the tent to Go Outdoors who exchanged it for another one with no quibble. We used our replacement tent a few days later for two nights and were really pleased with it as the waterproofing was definitely working. However, the second time we used it we discovered that no matter what we tried we cannot stop a massive amount of condensation building up inside the tent. It is so bad that it drips down on to the bedroom compartment inside. On it's third outing the weather alternated from hot to cold very frequently and there was a constant layer of condensation inside the tent. Despite all our efforts to keep it dry and ventilated mildew actually began to form on it whilst it was in use. I could understand mildew forming if it was packed away wet and stored, however I have never heard of this happening whilst a tent is in use and we have been careful to dry and thoroughly air the tent after every use. It has in total only been used for 9 days! We are taking it back again this week as it appears from the reviews on the go outdoors site that this is a common problem for this particular tent. I definitely would not recommend this tent due to the condensation problem which is such a shame as we loved everything else about it. Add your review of the Enigma 4! The Hi Gear Enigma 4 is a simple tunnel tent with a spacious bedroom and living area, and plenty of windows to give it a roomy feel and let light in. Its fully sewn in groundsheet will keep out drafts and rain (and insects), while the mesh panels on the windows and door make ventilation easy on stuffy days. Plenty of pre-attached luminous guylines help to keep the tent stable in windy conditions, and remain visible in low light (especially on a crowded campsite). The electrical cable access point makes it easy to use your appliances in comfort. There are a few additions to the Enigma 4 available, to make your camping experience even more comfortable. The Enigma 4 Carpet will make it feel more homely, the Enigma 4 Footprint will insulate and protect the floor (and make pitching the tent even easier), and you can extend your sheltered space with the Enigma 4 Canopy.